The Basford Bystander is a Community Newspaper devoted to Nostalgia, Local History and memories from folk (and ex-pats) about Basford in Nottingham and the surrounding area. 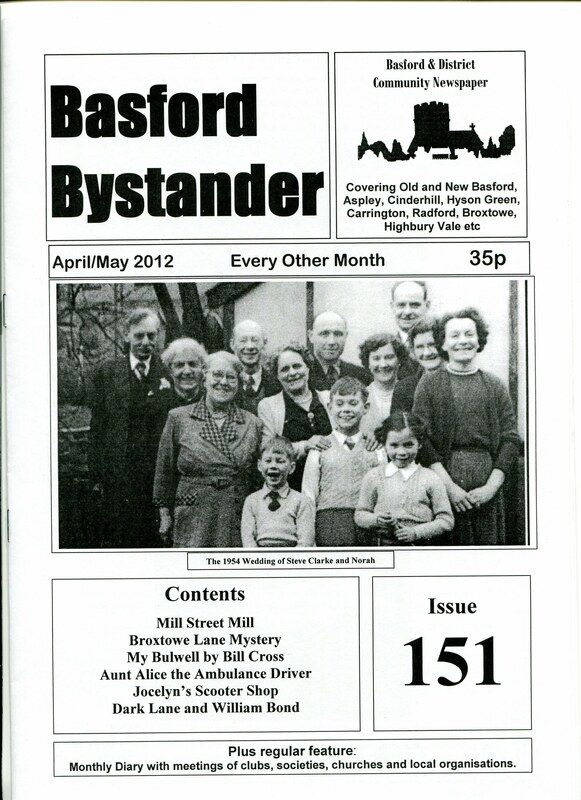 The Basford Bystander is published every other month at 35p per copy. An Annual Subscription of £5.50 (6 x 35p per copy plus p&p) sent to Christine Smith, The Circulations Secretary, at the address below will ensure that Basford Bystanders for the year (six issues) will be mailed direct to your home address. Alternatively and especially for Overseas readers - the Basford Bystander can be sent in pdf format direct to subscribers by e-mail. Please e-mail editor@basfordbystander.org.uk for details of this service and a sample copy. This alternative represents a huge savings on postal costs.